A dark novel of obsession, faith, death, and what may exist on the other side, Revival follows Jamie Morton from his first meeting with Reverend Charles Jacobs when he was six years old to the terrifying events that unfold almost fifty years later. It has been a while since readers of Stephen King have seen him dabble in the genre that made him such a success– horror. 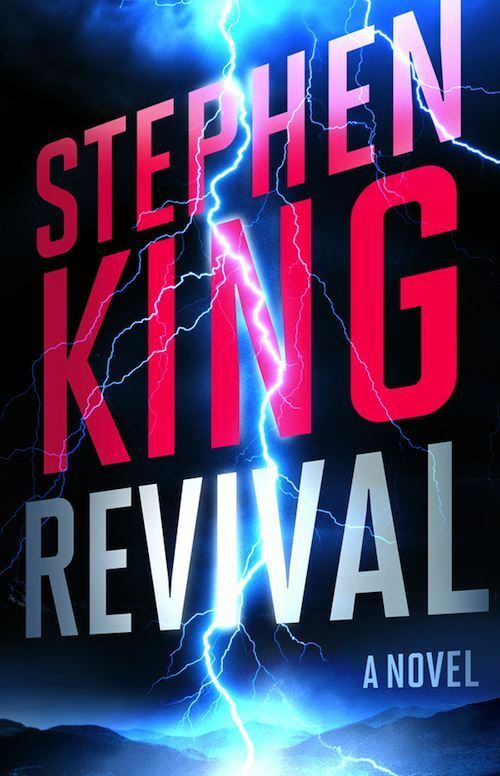 Revival, out today, is a return to the horror genre, and has been promoted to be King’s most terrifying novel to date. That’s right; even more terrifying than his early works such as The Shining and Salem’s Lot. You must be wondering if the novel does indeed rectify such claims. In some ways it does. The thing I have learned while reading King’s books is that he isn’t one to let the blood and gore flow from the start (at least in the books of his that I have read). Instead of reverting to horror right from the get-go, he adds in a little creepiness here, a little creepiness over there. He gradually weaves it throughout the story, letting it grow. Then, when the reader gets to the last seventy-five pages or so, he doesn’t let up. Everything gets creepy, and then there is the climax. And the climax is indeed terrifying, and qute unlike anything King has done before as far as I know. King has always been a master at creating characters that one can connect to quite easily. They have flaws, they have fears, they have passions. It is the latter that comes into play the most in Revival. Jamie Morton is a character that readers of any age can invest themselves in. The novel spans over a period of about fifty years, which gives us a glimpse of Jamie’s life as young child who meets the new minister in town, a teenager in love, a young man as a drug addicted musician, and an older man who has come to learn more about the world of the unknown that he dares to think about. Charles Jacobs is extremely well-developed. King does a wonderful job of progressing Jacobs’ insanity gradually to the point where we don’t think there is something seriously wrong with him until three quarters of the way through the novel. After that, Jacobs’ himself is a big part of the terrifying climax that is sure to unsettle many of readers. It is clear that King has not lost his talent enrapture his readers in a story that terrfies, yet keeps its humanity all the while. Note: I was given a free review copy in exchange for an honest review from the publisher. All thoughts and opinions are mine. Good review. I’ve discovered that King’s horror novels I’ve read aren’t as gory as they are creepy, and that is what makes them so terrifying. That is the point though. 🙂 I’ll read this when I get a chance, I have a long too read list.